A woman grips a small bouquet of colorful Mexican paper flowers meticulously crafted from delicate crepe paper; a man presents a pair of carpenter’s tools. Another grips a silver lined sombrero. These objects connect each of the owners who hold them with the community where they live, work and play — Boyle Heights. Metro-commissioned artist Sonia Romero captures the essence of communities in thoughtful, unexpected ways in her artwork. A longtime collaborator of Romero’s, artist and photographer Rafael Cardenas, photographed people for Romero to reference in the creation of her artwork designs. She translated the photographs into line drawings then uses them to create delicate paper cut pieces. These paper cut pieces are then incorporated into an artwork design composition. Romero’s paper cut compositions have previously been painted, screen printed onto ceramic tile and laser cut into steel. Her forthcoming artwork for Mariachi Plaza Station will be a hand-painted mural located on the concourse level of the station. Romero hand-cuts a drawing to create a paper cut piece. Romero holds a paper cut piece. Los Angeles-based artist Romero has exhibited widely in Southern California and beyond. Her public artworks include a ceramic mosaic tile mural at Westlake/MacArthur Park Station, a Through the Eyes of Artists poster, and mural commissions for the Los Angeles County Arts Commission and the Community Redevelopment Agency. She received her education at the Los Angeles County High School for the Arts and her Bachelor of Fine Art degree from the Rhode Island School of Design, with an emphasis in printmaking. She is the daughter of renowned artists Nancy Romero and Frank Romero, and the granddaughter of Frank and Edith Wyle, founders of the Craft and Folk Art Museum in Los Angeles, California. 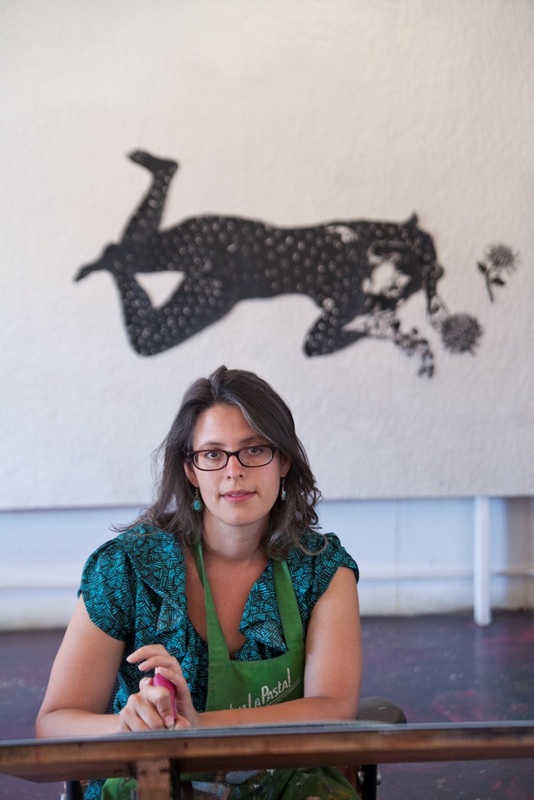 Artist Sonia Romero in her studio. Image provided by Todd Gray.